How we love thee! Puff and I had high expectations for the medieval town of Tallinn, Estonia, and we were not disappointed. Everything from the cobblestone streets to the old city wall... it was eye candy for the traveler's soul! 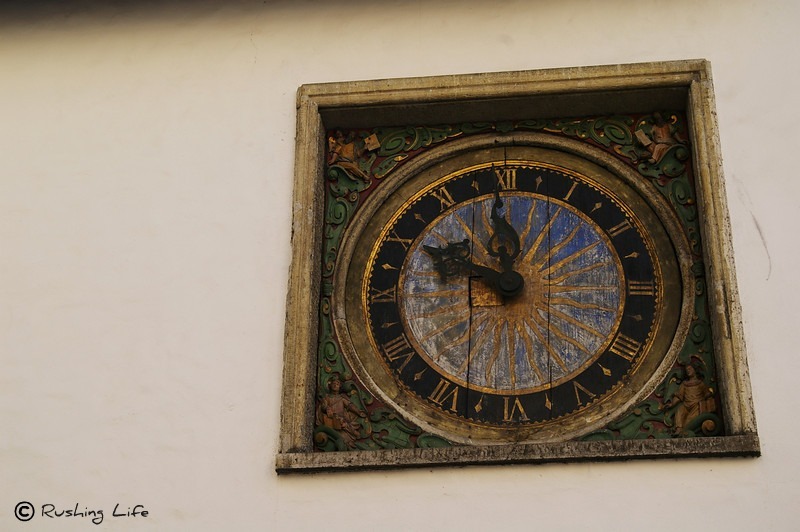 This cool clock was on the side of the Church of the Holy Ghost and reportedly is from 1633. The church is a 14th century design. I'm not 100% sure the history of the area, but it definitely was seemingly spared any major damage during the war. And perhaps being locked away behind the Iron Curtain for so long helped it freeze in time even more. But definite props go to the townspeople for restoring it to this glory! Puff and I aren't sure if the rest of Estonia is this amazing, but we definitely would consider a trip back there in our future. Perhaps we could bundle it with Latvia and Lithuania as well! (Just watched a show about Riga, Latvia, and it looks just as cool... only full of Art Nouveau buildings!) Never hurts to dream, right? We lucked out that Estonia was full of dreaming possibilities!